The excavations and subsequent analysis of several sites, both caves and open air sites, have found evidence of occupations by hominins in different periods, from 1.3 million BP to less than 3,000 years ago. Digs at Sierra de Atapuerca have focused on four different sectors: Trinchera del Ferrocarril, Cueva Mayor, Cueva del Mirador and the open air karst zone. As its name suggests, the Trinchera del Ferrocarril (Railway Trench) is an artificial trench dug during the construction of a mine railway. In plan, the trench is a 500 metre long arc running N-S through the southern part of the Sierra. The Sima del Elefante (TE) site is the southernmost cave in the Trinchera del Ferrocarril. The first archaeo-palaeontological work here was in 1986, consisting of a testpit to determine the characteristics of the infill, its archaeological potential and a rough chronology for the sedimentary deposits. Systematic excavation of the site began in 1996, and has continued uninterrupted down to the present day across a 32 m2 excavation area. The stratigraphic succession at Sima del Elefante is 15 m wide, with a 25 metre thick and with high degree of heterogeneity due to lateral and vertical lithological changes. The sedimentary deposit is divided into 21 units, grouped in turn into three sedimentary phases. Palaeomagnetic analysis has detected polarity changes at the basis of unit TE17. Sediments below this unit from TE16 to TE7 have reversed polarity and have been assigned to the Matuyama subchron (> 780 ky). Analysis of cosmogenic cores shows that the age of sublevel TE9c in Sima del Elefante is 1.22 ± 0.16 Myr. These dates are consistent with biochronological data. On the basis of biochronological material, more recent units containing archaeo-palaeontological records of the site (TE18-TE19) have been attributed to the second half of the Middle Pleistocene, around 250-350 ky (OIS 9-8). Lower levels have yielded a rich faunal association including small animals such as birds, lagomorphs and beavers, as well as medium and large sized animals. The climatic and environmental reconstruction on the basis of faunal analysis indicates that the landscape around Sima del Elefante through the lower sequence (Lower Pleistocene) included open habitats dominated by moist, wooded areas, large areas with permanent water. In the upper units, equids remains are predominant, although remains of other herbivores and carnivores have also been found. For these units, the suggested landscape is a moist forest with open spaces and possibly drier and colder conditions than the Lower Pleistocene units. Evidence of human activity has been documented in the Middle Pleistocene units and also in the oldest units of Sima del Elefante. By 2013, 127 lithic artefacts had been located. To date, 86 stone artefacts have been recovered from the Lower Pleistocene Units. The main raw material is chert of both Cretaceous and Neogene origin. Three quartz objects and some artefacts in Cretaceous limestone have also been found. All the raw materials could have been found within a 2 km radius of the site. The most represented categories are related to knapped products (flakes and flake fragments). In 2013, a chert flake was unearthed in unit TE8, the oldest evidence of human activity found to date in Atapuerca. In the Lower Pleistocene units, no pebble tools, handaxes or cleavers have been found. This assemblage has been assigned to Mode 1. Some of the faunal remains from the lower units (TE7-TE14) bear signs of anthropogenic modifications (cut marks and breakage). The faunal remains thus suggest that most of the anatomical assemblage is the result of low intensity occupations, possibly located near the cave entrance. Special mention must be made of level TE9c (1.22 ± 0.16 Ma). At this level, in addition to indirect evidence of human presence, three hominin fossils were found: a mandible, a phalanx and a humerus fragment. These remains were provisionally attributed to H. antecessor, however after a comparative morphological analysis of the mandible, Bermúdez de Castro et al. concluded that its attribution to any known taxon is unclear, and thus suggested that it should be referred to as Homo sp. Along with these human remains, faunal remains with signs of anthropic intervention and 33 stone objects were found. The Middle Pleistocene Units TE18 and TE19 have yielded 41 artefacts. Middle Pleistocene material includes a considerable use of sandstone, quartzite and Neogene chert. Knapped products, retouched flakes and hammerstones predominate in this lithic assemblage, along with four cores. The predominant knapping strategies are unifacial and unidirectional, but there is also evidence of centripetal knapping in some products. The largest proportion of morphotypes are sidescrapers and denticulates. There is also a large unifacial pebble tool, with a similar morphology to a cleaver, a sandstone handaxe, as well as a point and a cleaver. The lithic industry found on the Middle Pleistocene levels has been tentatively ascribed to Mode 2 (Acheulean). The Gran Dolina site (TD) is an 18 metre thick cave infill. Its stratigraphic succession was initially divided into 11 units, TD1 to TD11 from base to top. The first systematic archaeological excavations were carried out between 1981 and 1989 in a 30 m2 area on level TD10 level. Between 1990 and 1991, work focused on TD3-4, the earliest levels with evidence of human activity. A 9 m2 test was initiated in 1993. The results of this test pit led to the start of the horizontal excavation of Gran Dolina from 1996 onwards, which covered an area of more than 95 m2. In 2001, excavation began on a series of overhangs in the western part of this site due to the threat of their collapse. This work recovered material from levels TD4 to TD10. At present, level TD10.3 (approx. 90 m2) is being excavated horizontally along with the overhang of TD3-4 (approx. 8 m2). Over 1,300 faunal remains of herbivores and carnivores have been recovered from unit TD3-4. Amongst the latter, the most frequent is the bear species Ursus dolinensis. At this moment Gran Dolina was a natural trap for ungulates which died when they fell in. Predator activity around these herbivore carcasses was uncommon. Some of the faunal remains show cut marks, and anthropogenic fractures suggest that human groups entered the cave to exploit the fallen ungulates and thus had primary access. Carnivore tooth marks have also been documented. A small collection of tools, primarily quartzite, has been recovered from this sedimentary deposit. The objects show simple working sequences, essentially reduced to obtain flakes from unipolar strategies and rough configuration of cobble choppers. In units TD5 and TD6.3 occupation by hyaenids alternated with ursids, which used the cave to hibernate. Hominins also occupied the cave, alternating with both carnivores to a lesser extent than at the next level up. Subunit TD6.2 is the result of an anthropogenic assemblage where a large collection of archaeo-palaeontological remains was found, including more than 180 hominin remains. Thermoluminescence and simulated infrared luminescence dating for this assemblage is 960 ± 120 ky. Palaeoenvironmental and palaeoclimatic studies indicate that overall, unit TD6 corresponded to a period with an interglacial climate, holartic vegetation and abundant resources. The human remains found in unit TD6 at Gran Dolina were assigned to a newly described species, Homo antecessor, which was proposed as the last common ancestor of modern humans and Neanderthals. H. antecessor has a number of features suggesting its “modernity”, such as a cranial capacity of more than 1,000 cc, a modern tooth growth pattern and a modern face in both its aspect and its growth forms. The TD6 hominins also shared some features of the postcranial skeleton with Homo sapiens. Recent studies suggest that H. antecessor may be a European lineage of Asian origin, close to the divergence point between H. sapiens and H. neanderthalensis. Zooarchaeological analyses have detected frequent cut marks and anthropogenic bone breakage on the remains found at this level, indicating that the hominins who occupied TD6.2 actively accessed the prey that they brought to Gran Dolina. Remains of H. antecessor are amongst their prey. This is the oldest case of anthropogenic cannibalism known to date, which current stratigraphic evidence suggests took place over a long time sequence. Anthropogenic modifications to H. antecessor and deer on level TD6.2 suggest that the butchering process was the same for both taxa, and that the remains were also discarded on the floor of the habitat in the same way. As to the lithic technology, chert -both Neogene and Cretaceous- is the predominant material, followed by quartzite, quartzarenite, sandstone, quartz and limestone. A degree of planning can be observed in the way these resources were managed, with all stages of the lithic production chains present (hammerstones, cores, flakes, retouched flakes and knapping debris). The reduction strategies are varied (longitudinal unipolar, centripetal and occasionally bipolar on anvil), and all seem to be aimed at the systematic production of small and medium size artefacts. This is the first point in the Atapuerca sequence where retouch is used systematically to make tools in the form of denticulates, notches and, to a much lesser extent, sidescrapers. To date, the only evidence of large-format tools is a single sandstone chopper. In the Gran Dolina sedimentary succession, the Matuyama-Brunhes palaeomagnetic boundary is located at the top of unit TD7. The Middle Pleistocene archaeo-palanteological fossil record in Gran Dolina therefore consists of units TD8, TD8-9, TD9 and TD10. The palaeomagnetic data combined with ESR and uranium series situate unit TD8 at the beginning of the Middle Pleistocene, circa 600 ky BP. This unit contains a large, diverse range of ungulates and carnivores. They bear no signs of anthropogenic action and there is no lithic industry. In fact, Units TD8 and TD8/9 are currently a hiatus in the presence of anthropic activity in Gran Dolina. This is the only section with no evidence of material culture, as four lithic industry items have been found in the unit immediately above (TD9), making this the first unit in Gran Dolina with evidence of human activity in the Middle Pleistocene, dated by TL at 480±30ka. Unit TD10 has the largest accumulation of archaeological remains in the entire Atapuerca complex. This unit is divided into 4 lithostratigraphic sub-units, identified from base to top as TD10.4 to TD10.1. The top two units (TD10.1 and TD10.2) are now fully excavated. Both sub-units have yielded large concentrations of archaeo-palaeontological material, with approximately 120,000 faunal remains and 35,000 lithic items recovered to date. This density of material shows an intense occupation of Sierra de Atapuerca by Preneandertal groups. Geochronological tests of TD10 to date include a TL dating of 430 ± 59 ky for the top of subunit TD10.3, and a series of ESR/UTh datings including two for TD10.2 (418 ± 63 and 337 ± 51 ky), one for the base of TD10.1 (379 ± 57ka) and an average of 337 ± 29 ky for its top. However, a slightly discordant average TL date (244 ± 26 ky) has also been obtained for the lower part of unit TD10.2. The archaeo-stratigraphic sequence ends with an archaeologically sterile unit (TD11) dated between 240 ± 44 ky and 55 ± 14 ky. The technology of subunits TD10.2 and TD10.1 is characterized by diverse, standardized operating sequences and tool configuration. Centripetal flake removal methods are predominant, along with some hierarchical cores and a somewhat predetermined size and shape in the products. The presence and degree of configuration of large standardized tools (handaxes and cleavers) is less than the assemblage documented at the Galería site, and instead there is a higher incidence of tools on small flakes which are moreover morphologically diverse and standardized. The rich archaeological level documented at TD10.1 could therefore reflect a local evolution from Mode 2 (Acheulean) to Mode 3 (Mousterian) in Sierra de Atapuerca. Finally, the top section of TD10.1 clearly shows a gradual decrease in the use of Gran Dolina. Technologically, it seems to follow the transitional trends identified in the rest of TD10.1. In fauna, TD10.2 is a clear case of specialized hunting focused on the exploitation of bison, as approximately 95% of the NISP (Number of Identified Specimens) and MNE (Minimum Number of Elements) correspond to these animals. In contrast, in sub-unit TD10.1 there is a broad spectrum of prey, with a predominance of ungulates such as deer and horses and also other animals such as small prey and a few carnivores. The information gathered from the analysis of the sub-units in TD10 excavated in their entirety to date suggests a wide variety of preneandertals’ subsistence strategies at the end of the Acheulean. The Galería site is 50 m south of Gran Dolina. It is divided into three sections: the central section (TG) linked to the north with a hall known as Covacha de los Zarpazos (TZ) and to the south with a vertical conduct known as Trinchera Norte (TN). The first archaeological works at the Galería site began in 1976. Systematic excavations were developed from 1982 to 1995. From 2002 until 2010 the works were focused on TZ. Since then, the excavations have focused on sector TG-TN. Nowadays, the excavation area affects to more than 40m2. The sedimentary infill at Galería consists of five lithostratigraphic units, identified from bottom to top as GI to GV. Archaeologically sterile Unit GI is the oldest. Units GII and GIII are rich in lithic and faunal remains. Units GIV and GV ultimately clogged this cave. While the latter were initially sterile, in the latest work phase GIV has yielded over 100 items including stone tools and faunal remains. The Matuyama-Brunhes transition has been detected in GI, at the base of Galería. TL, IRSL and ESR datings for units GII to GIV suggest that it was formed between 500 and 250 ky.
lithic assemblage associated with abundant faunal remains. Two human fossils, a mandible and a skull fragments have been attributed to H. heidelbergensis. The lithic items in Galería were produced from 7 types of raw material, all found within 2 to 5 km of the site. Neogene chert is most abundant, followed by quartzite and sandstone. Other material such as Cretaceous chert, limestone, quartz and schist, have a minority presence. The operative chains are highly fragmented and the knapping sequences are mainly allochthonous. The knapping inside the cave was aimed to solve specific requirements, and was highly expeditious. Most of the artefacts were produced outside the cave. The best represented exploitation methods are multipolar centripetal and unipolar longitudinal, reflected by products and cores. Also, other strategies such as multipolar orthogonal have been documented. Knapped products are the most common structural catergory. Large cutting tools are well represented, although the small and medium formats are predominant (scrapers, denticulate and points). In the earliest levels (GIIa), the large tools are mainly made on quartzite cobbles, while from GIIb onwards, the large tools are made on Neogene chert and sandstone flakes. The main uses of the tools were for butchering, although work on hides and, to a lesser extent, plant material has also been identified. The majority of the faunal remains in Galería are from herbivores, with a major presence of deer, horses and, in smaller numbers, bovines and rhinoceros. Carnivore remains are scarce. Galería also has a good representation of micromammals and birds. These remains show abundant evidence of carnivore intervention (tooth marks) and less human intervention (cut marks and fractures). Nevertheless, the faunal association at Galería does not match the expected pattern of an assemblage originated by hominins or carnivores. The taphonomic features suggest that Galería did not meet the environmental conditions appropriated to the establishment of human occupations, nor was it used as a carnivore den. The origin of this accumulation was the vertical conduct in TN, which acted as a natural trap for herbivores. Fallen animals attracted the attention of carnivores and hominins alike to exploit these meat resources. Carnivores, mainly canids, prioritized the in situ carcass consumption, sometimes with secondary access to the carcasses left by the humans. On the other hand, hominins usually had a primary access and processed the animals in order to transport them out from Galería in either skeletal segments in the case of large animals or whole animals when permitted by their weight. The entrance to the complex known as Cueva Mayor-Cueva del Silo is less than a kilometre from the Trinchera del Ferrocarril sites. There have been several sedimentary infill chronologies in this complex which have yielded archaeo-palaeontological remains. The Sima de los Huesos site lies inside the Cueva Mayor-Cueva del Silo karst system. Sima de los Huesos (SH) is roughly 500 metres from the entrance to Cueva Mayor, at the bottom of a 13 metre vertical shaft. There are two parts to this cave: the ramp and the site itself. The former consists of an approx. 10 metre long ramp on a 30º slope which descends to a small chamber 5 metres below. The second part consists of a roughly 8 metre long by 3 metre wide chamber. Three stratigraphic test digs have been conducted on the ramp, named SRA (Sima Ramp Upper Test), SRM (Sima Ramp Middle Test) and SRB (Sima Ramp Bottom Test). Two excavation areas have been distinguished in Sima de los Huesos (Area A and Area B). Sima de los Huesos has yielded the world’s largest and most comprehensive assemblage of human fossils from the Middle Pleistocene, with approximately 5,000 items recovered to date from at least 28 individuals. Most are adolescents or young adults, with very few children or senile individuals. The human representation from Sima de los Huesos includes every part of the skeleton. These fossils have been attributed to a single biological population inserted amongst the hominin ancestors of the Neanderthals, the species Homo heidelbergensis. Morphologically, the fossils from Sima de los Huesos exhibit many primitive features that are not present in Neanderthals. They also bear some derived Neanderthal traits in the facial skeleton and postcranial bones. El Portalón is one of the current entrances to the Cueva Mayor-Cueva del Silo karst system, approx. 1040 m asl. It never became fully clogged by external sediment. The large, well-reserved stratigraphic sequence (over 9 metres) of this entrance porch is an exceptional site for the study of recent prehistory (the last 10,000 years) as it documents a wide range of human activities during this period. Almost nothing has been published about the excavations in the late 1960’s and 70’s. Work by the Atapuerca Research Team in 2000 discovered a much broader stratigraphic sequence than the previously known strata, which has been divided into two major sedimentary units. The lower unit (Upper Pleistocene) contains a significant palaeontological record but very few traces of human activity in the form of small flakes. The upper unit (Holocene) has a homogeneous sediment with abundant evidence of material culture. Its human occupations are Medieval, Roman, Iron Age, different stages of the Bronze Age, Chalcolithic, Neolithic and Mesolithic. The relevance of this new sequence in Portalón is due to the paucity of information about the Upper Palaeolithic, Mesolithic and Neolithic in inland Iberia, particularly on the Northern Plateau. Although Portalón occupations in the Middle Ages, the Roman Empire and the Iron Age were sporadic, surprising material has been found, including an Almohad gold coin from the 13th century, the only one known is this region. The Bronze Age occupation (2nd millennium BC) was intense, with thousands of pottery shards from everyday materials- plates, bowls, pots, large jars, cheese containers and pitchers. During the Chalcolithic (3rd millennium BC), Portalón was used as a “Sanctuary” or burial ground for humans. The numerous large-format stones in the cave were rearranged to form burial mounds in which the corpses and ritual objects were placed. Although many of these burials were later disturbed by Bronze Age peoples, the intact body of a 6.5-7 year old child buried in a pit-like structure made from stones was found in 2012. Ceramic objects were placed around the head, chest, knees and feet, and a near-complete skeleton of an immature ungulate lay at its foot. The excellent state of preservation facilitated the detailed study of the teeth and bones in the skull, face, arms and legs. Although the Neolithic levels (IV-V millennium BC) are yet to be fully excavated, they will no doubt yield surprising results. At present, information is only available from one test pit, which has nevertheless yielded a wide range of typically Neolithic ceramic typologies with Boquique decorations, incised motifs filled with red paste, bottles with conical bases and broad handles, personal adornments including a ring and two bracelets in marble, bone tools including an awl made from a deer metapodial, geometric implements and flint backed blades. is also being used in major studies of the climate and environmental patterns in the Upper Pleistocene and Holocene, as well as geophysics and new geochronology techniques applied to the archaeological record. El Mirador cave overlooks the southernmost flank of Sierra de Atapuerca at an altitude of 1,033 m asl, with commanding southerly views across the Arlanzón River valley. The mouth of this karst cavity is now approximately 23 m wide and 4 m high, penetrating some 15 m inwards. Its current shelter-like form is due to the collapse of part of the roof. In 1970, a small test pit dug by the Edelweiss Caving Group unearthed Bronze Age remains. 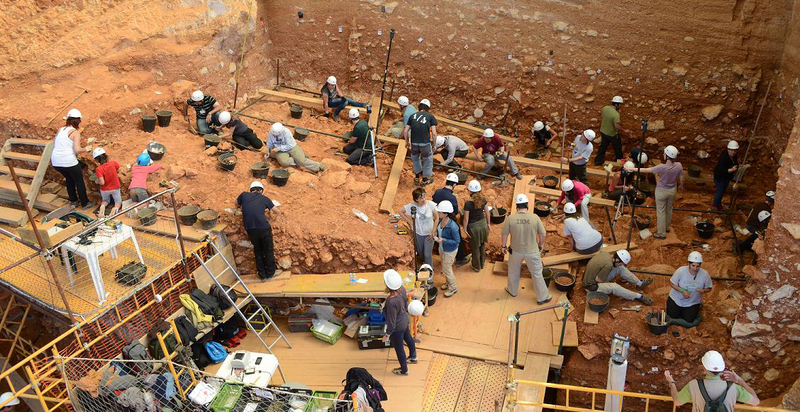 This work was not continued and the the excavation by the Atapuerca Research Team began in 1999. In the following 9 years, a 20 metre deep test pit was dug in a 6 m2 area in the centre of the zone now sheltered by the roof, in order to ascertain the archaeological potential of the site. In 2009, excavation began in two new sectors at the NW and NE ends of the cave, in contact with the current wall. The 20 m profile explored in the 1999-2008 survey consists of 14 metres of Pleistocene deposits and 6 metres of Holocene material. The Pleistocene deposit is named MIR51. A Holocene sedimentary layer rests directly on top of MIR51, four metres of which correspond to Neolithic occupations between the last third of the 6th millennium and the first half of the 4th cal BC, MIR24 to MIR6, while the remaining two metres are from the Middle Bronze Age, MIR4 and MIR3A, between the 2nd and 4th quarter of the 2nd millennium cal BP. This part of the Bronze Age is also represented in sector 100 by levels MIR103 to MIR105. All these levels were essentially formed as a result of the cave’s use as a livestock pen. They contain items from domestic and agricultural ac-tivities and areas use as habitats. Intense livestock farming left a sedimentary layer, basically dung, which was piled together and burned at regular intervals in order to reduce the volume and eliminate parasites. This left an alternation between unburned layers of manure and nodules of ash from burned dung, a feature of this type of site. The oldest evidence of burials has been dated at around the second quarter of the 3rd millennium cal BC, during the Chalcolithic. Remains of at least 22 individuals have been identified (MIR203), laid in a small natural chamber and accompanied by a small number of objects: smooth hemispherical bowls, fractured deer antlers and river shell valves. Cannibalism, probably of a ritual nature, has been documented in relation to this phase of the cave’s use for burials in the final third of the 3rd millennium cal BC, i.e., at the start of the Bronze Age. Skeletal remains of six individuals bear evidence of having been defleshed, fractured, cooked and eaten. The remains were found in a small hole dug in the middle Bronze Age levels (MIR4), indicating that they were collected and buried hundreds of years after their death, once livestock farming resumed here. The final stage of this site’s use as a burial cave is marked by a single burial (MIR106) of a young male who was placed on one of the rock ledges inside the cave, contextualised chronologically in the second quarter of the 2nd millennium cal BC, i.e., the Middle Bronze Age. The first documented occupations of the cave by Neolithic groups were around the last third of the 6th millennium cal BC. From the outset and throughout the Neolithic (MIR24 to MIR6), it was repeatedly used as a habitat and a livestock pen, primarily for sheep and goats. This dynamic continued until the middle of the 4th millennium cal BC, with only variations in the material culture, primarily ceramics. The use of El Mirador as a pen then ceased and a period of apparent abandonment began. Between the second quarter of the 3rd millennium and the second quarter of the 2nd millennium cal BC, El Mirador was used once again as a burial cave. Group burials, ritual cannibalism and individual burials associated with different periods have been documented. Extensive excavation will allow us to discover whether the differential treatment of the corpses and the different types of burial reflect different funeral traditions, or whether they evolved together. Immediately after the last documented burial, the use of El Mirador as a pen resumed with exactly the same livestock handling features as the Neolithic period. This continued until at least the last quarter of the 2nd millennium cal BC, when the stratigraphic succession was interrupted, most probably by the removal of sedimentary material from the cave. Decontextualized items point to the continuation of human activity in the late Bronze and Iron Ages, and also most probably in historic times as well. In fact, the cave was still used by shepherds in the 20th century. The Upper Pleistocene in Sierra de Atapuerca is well documented outside the caves. Archaeological surveys conducted between 1999 and 2003 discovered 31 open air campsites. During this work, 314 km2 were inspected around the Trinchera del Ferrocarril sites to ascertain how Upper Pleistocene groups of hunters and gatherers organized their daily lives. The most recent open air site in Sierra de Atapuerca, Valle de las Orquídeas was excavated in 2000 and 2001. In 2004, work commenced on the Hundidero site (HU) in 2004, where up to four different occupation levels were identified. In 2006 a test pit was excavated at another site, Hotel California (HC) which ended in 2010 with five detected archaeological levels. Work is currently under way at Fuente Mudarra, where three archaeological levels have been found so far. The data obtained to date show that Sierra de Atapuerca was occupied by groups of Pleistocene hunter-gatherers from at least 70 ky until to 27 ky BP. Datings from Hundidero are 70.556 +11,011 BP (TL) for the oldest level and 30,221 + 3,636 BP for the most recent. Middle Palaeolithic stone implements have been found on each of the four archaeological levels, with more than 50 tools made from local raw material. Hotel California datings show that the oldest occupation in this area was around 71.0 ++5.6 ky and the most recent 48.2 ky +3.3 ky BP. A 24 m2 test pit –larger than Hundidero– was dug at this site, which obviously yielded much more lithic material: up to 2,000 items, all manufactured from local raw material. Material from the first test pit at Fuente Mudarra in 2011 yielded datings which match the most recent period at Hotel California. Valle de las Orquídeas is an open air site from the end of the Upper Pleistocene. It is located at the top of Sierra de Atapuerca, south of Alto de Matagrande (1,078 m), at the head of a valley connected to a broad exokarst formation somewhat like a sinkhole, with water at the base available to the wildlife and humans who inhabited this area. During the 2000 and 2001 field seasons, we excavated an 18 m2 area which yielded 306 lithic items associated with terra-rossa deposits. Two TL dating of this terra-rossa, the base of the analysed stratigraphic sequences, showed an age of 27,507 ± 2,295 years BP and 29,955 ± 2,319 years BP. Most of the items are in Cretaceous chert, which is found in the form of small nodules encrusted in the Sierra crevasses. Valle de las Orquídeas may well represent the last of the stages in human evolution that has remained undiscovered in Sierra de Atapuerca: the cultural and biological transition between Neanderthals –the presumed occupants of the upper levels of Sima del Elefante and Galería de las Estatuas– and modern humans, the early settlers of the stage represented by the Mirador and Portalón caves.